Village officials and supporters join Erin Franklin for the Little Free Library ribbon cutting at Veterans Park. Little Free Libraries are popping up throughout the Village of Royal Palm Beach, thanks to the efforts of local nurse and mother Erin Franklin. 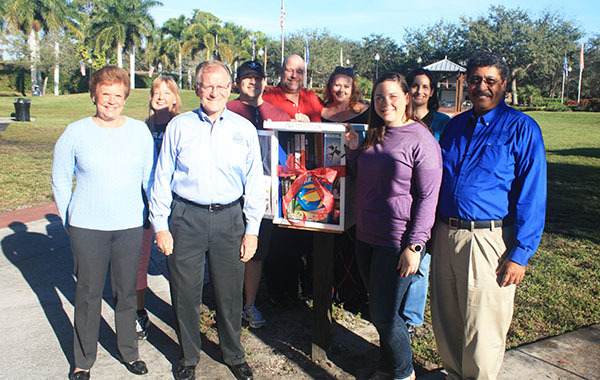 Joined by village officials and well-wishers, Franklin cut the ribbon on Saturday, Jan. 19, officially opening the community’s third Little Free Library, this one at Veterans Park. The idea is simple. Little Free Libraries are decoratively painted weatherproof boxes where both adults and youngsters are encouraged to take a book and drop a book. The free book exchange idea has grown so popular, both in the United States and abroad, that the new little library at Veterans Park is officially the 78,979th library listed at www.littlefreelibrary.org. With the success of the village’s first two libraries, located at Earth Day Park and Franklin’s Sunflower Circle front yard, the community has embraced the concept and plans are being made for more Little Free Libraries in other Royal Palm Beach public parks and in more front yards. Under Franklin’s leadership, the project has become a vibrant community effort. A local grant has been landed; partnerships with agencies, schools and the business community are being formed; and volunteer “stewards” are being recruited to help oversee future little libraries. “Once I decided I wanted a Little Free Library of my own, it took about a year to get it approved and installed because it was new and unknown to code enforcement,” Franklin explained. She thanked Vice Mayor Selena Samios for helping get the project underway. It’s an all-hands effort. Mayor Fred Pinto and several members of the Royal Palm Beach Village Council showed up in support of the program at the Jan. 19 ribbon cutting. Councilman Jeff Hmara and his wife Carolyn hand-painted the box at Veterans Park in a patriotic theme, as well as the little library at Earth Day Park with an environmental theme. Samios convinced the Rotary Club to get involved, which successfully applied to the Children’s Services Council for a $2,500 grant to expand the program within the village. 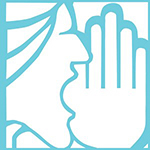 Little Free Library is a nonprofit organization that inspires a love of reading, builds community and sparks creativity by fostering neighborhood book exchanges around the world. There are almost 80,000 Little Free Libraries in all 50 states and 88 countries. Franklin is driven by her desire to improve literacy. Franklin is proud to take part in a project promoting literacy. “There are many kids who can’t afford books. I hope this will be a step forward to helping our community,” said Franklin, who works in labor and delivery at Wellington Regional Medical Center and has three young children of her own, who were a part of the inspiration for what was the very first Little Free Library in Royal Palm Beach. Local author Dan Bodenstein is delighted with Franklin’s efforts and showed up at the ribbon cutting with a donation of a stack of new children’s books. “We are launching a new title soon, and I plan to donate a portion of future books sales to this wonderful effort,” he said. Franklin used the ribbon cutting to try and enlist even more community support. “We really need both children and adult books donated, and more stewards to step forward,” she said. A steward is a member of the community who takes responsibility for overseeing a particular little library. Those interested in becoming involved in the project can visit the Little Free Libraries of Royal Palm Beach page on Facebook, or check out www.littlefreelibrary.org.